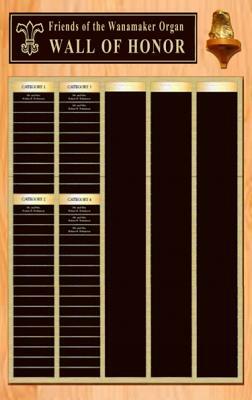 You can have your name or that of a loved one permanently displayed inside the Wanamaker Organ on our Wall of Honor for a tax-deductible gift of 1000! Gifts of $2000 will be place your name as a Wanamaker Fellow. Gifts of $5000 will place your name as a Benefactor. Gifts of $10,000 will place your name as a Herald Angel. Your fully tax-deductible gift will help keep the Wanamaker Organ singing proudly into the decades ahead and provide a permanent remembrance of your generosity. To place a larger gift, simply change the amount in the donation field.